It's all about Software and Data. I am a project-based BI consultant, specializing in automating transitions from legacy reporting applications into modern BI/Analytics to leverage Social, Cloud, Mobile, Big Data, Visualizations, and Predictive Analytics. I help clients make better decisions using data analytics software. 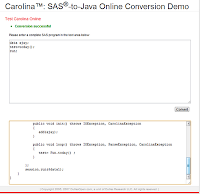 Ajay Ohri at DecisionStats posted an article recently about a software product which claims to be able to convert the SAS statistical processing language into Java. If so, that could mean that SAS customers could see a tremendous savings in licensing fees. "Profound" is how Dulles Research, the vendor of this tool called Carolina, describes the cost savings of Java over SAS. Serial entrepreneur Drew Eginton owns the company. 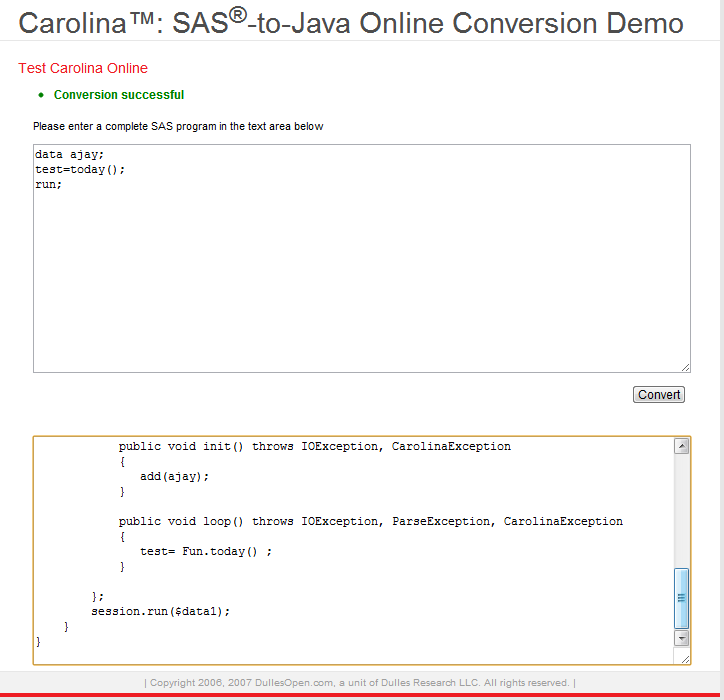 While automatically translating SAS into Java may be technically possible, a conversion undertaking of this magnitude would still involve a serious amount of parallel testing. Companies will also run into plenty of resistance from their in-house SAS experts. In fact, they should expect their mainframe capacity planners to revolt. These guys traditionally use the MXG product from Barry Merrill to calculate the system usage. Dulles Research has evidently already run into this bunch, as they put this statement on their main webpage: "Run MXG SAS-free." SAS also has its own data structure, so eliminating SAS would mean converting any existing data into another format. The replacement language would need to be able to access that new format. For example, the WebFOCUS 4GL language has no construct for arrays; there just isn't anything like that. So figuring out how to convert SAS array processing into WebFOCUS array processing is something I would have to think hard about to solve. Of course, Java is a lower-level language than the WebFOCUS 4GL so Dulles Research could write their own classes to replicate anything that SAS can do. It might take a while, but it is definitely possible. While SAS is one of the hottest BI technologies on the market, its licenses can be very expensive. Many companies, especially those with mainframe licenses, are looking for ways to reduce that cost. If you are considering replacing SAS with some other product, contact me about our rapid assessment engagement using the BI Analyzer product to scan your SAS applications (include supplemental technologies such as FOCUS, JCL, CLists, etc.) and save the results into a data repository from which we can quickly run analytics on the size of the modernization effort.